partial offsetting of higher soil P levels resulting from manure application and limiting P loss to local surface water. The Manure and Soil Health (MaSH) blog will unpack some of the potential benefit of manure to soil quality by reviewing research for clues as to manure’s benefits. 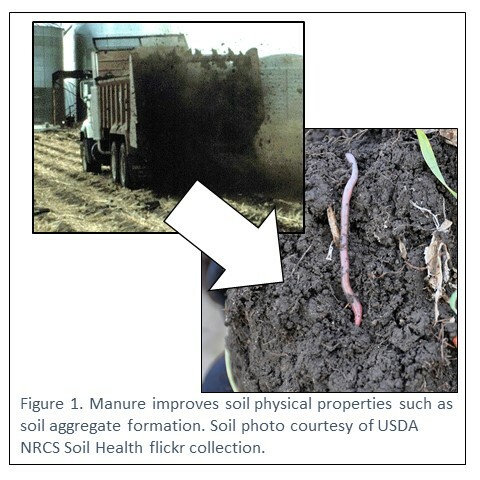 Several research studies have documented manure application impact on improvement of soil physical properties. This article examines published research conducted in Nebraska — The Effects of Manure Application on Soil Aggregation by Charles Wortmann and Charles Shapiro, soil scientists at the University of Nebraska-Lincoln. the residual effects of manure on aggregates. Three studies were conducted with silty loam or silty clay loam soils. Feedlot manure solids were applied at 20 to 22 dry tons/acre (roughly 40 to 44 wet tons/ac) and swine manure at 1.2 dry tons/acre (roughly 4800 gallons per acre if manure is 6% solids). Four conclusions were drawn providing clues about manure’s benefits. 1. Water-stable large macro-aggregates were increased two to three times for manured soils compared to commercially fertilized soils. 2. The formation of macro-aggregates occurred with all manures with some advantage for compost and similar effects for raw feedlot manure and swine slurry. The swine manure’s solids application rate was only 6% of that of feedlot manure but still achieved very similar benefits. This might suggest that achieving the physical soil property benefits may be more dependent upon the rapid growth in soil micro-biology and less dependent on the total solids in the manure. 3. Water-stable macro-aggregates formed within 15 days after manure application, persisted over a seven-month observation period, but were no longer found on a separate tilled site that was without compost for five years. The effect of manure or compost on macro-aggregate formation soon after application (first observation made at 15 days) suggests an immediate value from manure application. The study observed this benefit lasted at least seven months but disappearing five years later. Other research has suggested this benefit lasts longer in no-till fields. 4. Phosphorus was observed to concentrate in the water-stable macro-aggregates, twice as great in the large aggregates as the whole soil P level. This may provide additional protection resulting from manure for holding P in the soil and reducing P in runoff. However, previous research has documented that P movement from cropland is connected to soil surface P levels. Managing manure to keep soil P levels low, near levels required for optimum crop production, remains our best practice for protecting water quality. But manure’s large aggregate building response and P concentration in those large aggregates help protect water quality. This article demonstrates the take-home message that manure improves the physical characteristics of our soils differently than commercial fertilizer. These improvements to the soil aggregates open the possibility for environmental and economic benefits.